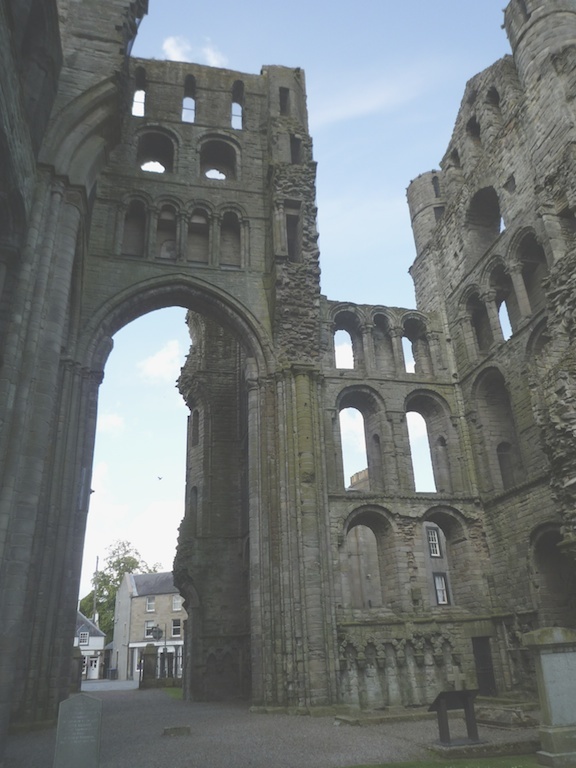 As you drive through the Borders town of Kelso, which sits astride the River Tweed, the ruins of Kelso Abbey loom up suddenly on your left, towering above the road. Kelso Abbey was founded by David I of Scotland, who encouraged a community of Tironesian monks to settle in Scotland under his patronage. 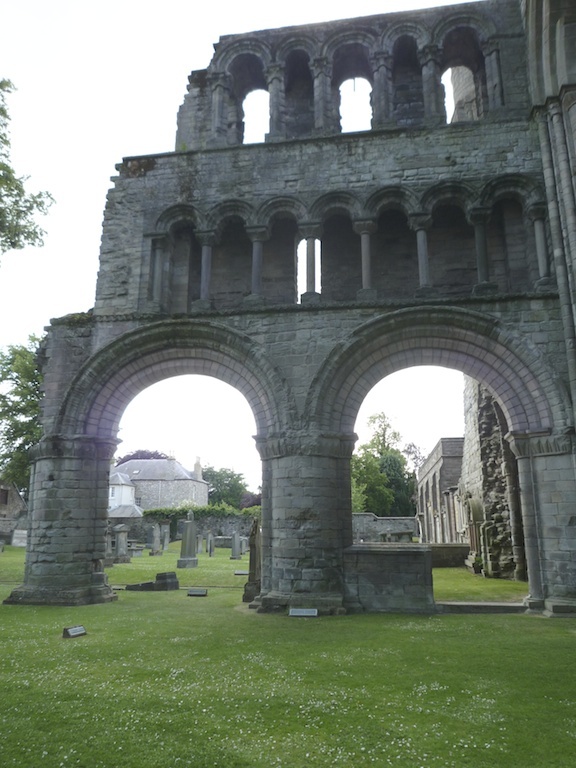 The monks arrived in the early 12th century, initially settling at Selkirk. However, they soon moved on to Kelso, where the construction of an impressive Abbey began in 1128. It is believed that the work took 75 years to complete. The architecture followed a pattern that was unique in Scotland, with two towers and four transepts. In its heyday, Kelso Abbey would have been a truly magnificent sight, inspiring visitors with profound awe. It would soon become a last resting place for royalty: David’s son, Henry, was buried in the Abbey in 1152. Kelso Abbey grew to become one of the wealthiest in the country, owning large estates in the Scottish Borders. It housed a superb library, and its Abbot was the first in Scotland to be allowed to wear a mitre, giving him precedence over all other Scottish abbots. Unfortunately for the monks, Kelso lay close to the border with England, and during the 1300s the Abbey and its inhabitants were caught up in the Scottish Wars of Independence. Forces spearheaded by William Wallace and Robert the Bruce clashed repeatedly with English troops under the leadership of Edward I, ‘The Hammer of the Scots’, and his successors, Edward II and III. It’s hard to imagine that the monks had much time to meditate. In 1460, James II of Scotland was killed within sight of Kelso Abbey. He had been besieging Roxburgh Castle, which had been under English control for a hundred years. Apparently wishing to show off his newly-acquired state-of-the art weaponry, he attempted to fire a large cannon known as ‘The Lion’, which had been imported from Flanders. The cannon misfired and exploded, killing him instantly. To get an idea of the fearsome size of The Lion, take a look at this picture of Mons Meg, a medieval bombard of the same stature, which now sits on the ramparts of Edinburgh Castle. James’ infant son (James III) was crowned at Kelso Abbey soon after his father’s death. The Scots didn’t surrender their Queen, and Henry was disappointed. At Kelso, whatever destruction had been left undone was completed in 1560, when Henry wiped practically all the abbeys and priories off the map. The Pope had refused Henry permission to divorce Catherine of Aragon, which would have allowed him the freedom to marry Anne Boleyn. Finding himself excommunicated, Henry vented his anger on the monasteries, declaring himself to be ‘supreme head in Earth of the Church of England’. Not one to be trifled with, he fabricated a reason to consider his marriage to Catherine null and void, and married Anne anyway. As for Henry’s son, Edward, he didn’t even reach adulthood. He fell ill and died at the age of 15, having acceded to the throne of England when he was nine. A turbulent period followed: at the centre of it all was the young Lady Jane Grey, a cousin of Edward, and – fatally for her – a Protestant. Nominated by Edward as his successor, Jane was Queen for nine days until she was executed to make way for Mary, Henry’s eldest daughter. Mary was a Catholic. So much for Henry’s fanatical burning of the monasteries! Anyway, let’s fast forward to 1649, when parts of the ruined Abbey were restored to form a parish church. By the early 19th century most of the ruins had been removed, much of the stone having been plundered for local buildings. Today there’s precious little left of Kelso’s original grandeur. The ruined west tower scores the sky like a broken sword, and its arched windows that once filtered sunlight onto quiet cloisters and grand coronation ceremonies are gaping and lifeless. Amazing to think of what it has witnessed, and what was sacrificed in the name of glory, greed or vanity… these ruins are peaceful but not tranquil, and they leave an impression of lasting defiance. Kelso Abbey is in the care of Historic Scotland. It’s open all year, and admission is free. Thank you, Francis! I enjoyed writing it. So pretty and yet amazing. Love the serene River Tweed photo, as if time has stood still. I envy you your surroundings. Thank you! The Scottish Borders are lovely – a place we hadn’t explored very much until we moved here. Thank you – glad that you found it interesting! Another very well written and interesting history lesson. I’m really glad you’re writing on The Hazel Tree but you would make such a good school history teacher! You manage to pick out points of interest and make the whole thing come alive with your words and pictures. That last photo is beautifully serene, you’re doing a great job, thank you for all the effort you put into your posts. Thank you so much! A history teacher? Crikey! 😀 I’m not sure I’d survive a week! But thank you for your very kind words. I love writing the articles and finding the pics to illustrate them. It is a terrifying thought, being a teacher, but I really do think you pass on what could be dull and stodgy information in a very interesting way. Looking forward to more!